Aspirin Coupon is a mailable coupon available at Save.ca. This is a new coupon which I found today. Visit Save.ca, select the coupon, create an account and claim your coupon. After you claim your coupon you will receive it within 1-2 weeks. 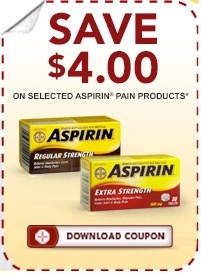 Aspirin coupon is a coupon to save $4 on select Aspirin products. Aspirin coupon is valid only in Canada. 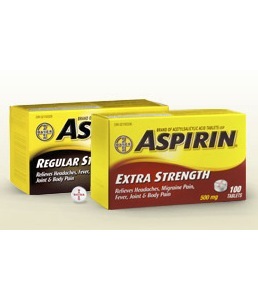 You will find Aspirin products in any drugstore, Shoppers drugmart, Rexall and more. Best for fast relief of headache, back pain, muscle aches, joint pain and also relief from pain and fever due to cold and flu. Bayer developed ASPIRIN® and began marketing this effective pain reliever over a hundred years ago. ASPIRIN® soon became the best selling medication in the world. As doctors developed experience prescribing ASPIRIN®, it was made available to be used without a prescription. Patients could now obtain effective pain relief without making a trip to the doctor.